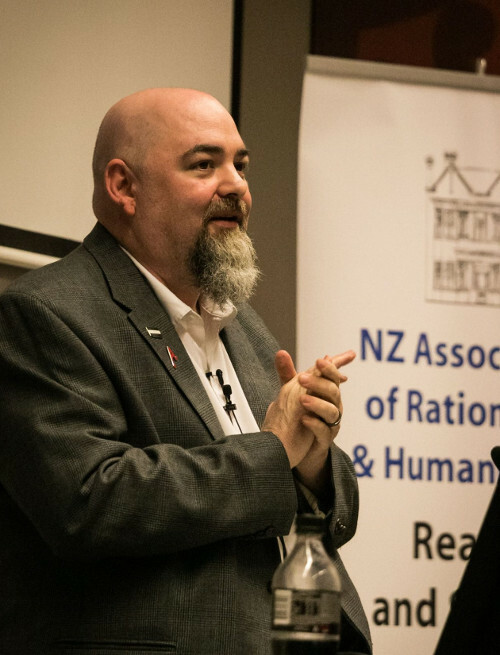 Matt Dillahunty, host of The Atheist Experience made popular on YouTube, has challenged an Auckland audience of primarily atheists to be more sceptical. He gave a talk recently to a group from the Reason and Science Society at Auckland University, the New Zealand Association of Rationalists and Humanists, and Auckland Skeptics. The theme of his talk was how sceptical thinking related to magic and gave the audience an example of his own magical skills. He continued to talk about how unsupported beliefs can impact communication of atheist and sceptical messages, and that it is counterproductive if additional unrelated views are included alongside atheistic views when trying to communicate atheism and scepticism in an environment where atheism is already the minority view. Dillahunty was a Evangelical Christian for much of his life despite having a sceptical approach to beliefs outside religion. In his thirties he decided to become a religious minister, and it was a result of his examination of the Bible in order to better develop his understanding and ability to argue for its truth that he began to apply the same sceptical thinking that he applied to other beliefs. Dillahunty often repeats his philosophy; to believe as many true things and the least false things as possible. Addressing the Auckland audience he said “We need to make people care about the truth. We need to care about what we believe and whether it is true”. How does Dillahunty know what the truth is? Truth he asserts is what can be demonstrated to be true. So when someone says something is true you cannot just take their word for it, you need them to demonstrate it through evidence and reason.